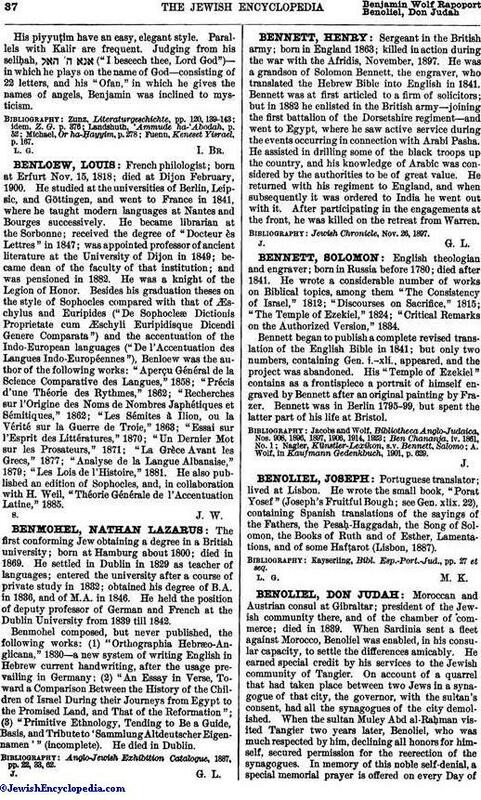 Moroccan and Austrian consul at Gibraltar; president of the Jewish community there, and of the chamber of commerce; died in 1839. When Sardinia sent a fleet against Morocco, Benoliel was enabled, in his consular capacity, to settle the differences amicably. He earned special credit by his services to the Jewish community of Tangier. On account of a quarrel that had taken place between two Jews in a synagogue of that city, the governor, with the sultan's consent, had all the synagogues of the city demolished. When the sultan Muley Abd al-Raḥman visited Tangier two years later, Benoliel, who was much respected by him, declining all honors for himself, secured permission for the reerection of the synagogues. In memory of this noble self-denial, a special memorial prayer is offered on every Day ofAtonement in the synagogues of Tangier. Judah Benoliel also possessed the full confidence of Cardinal Mastai-Ferretti, afterward Pope Pius IX. When the latter returned to Italy from Chile he entrusted Benoliel with large sums of money. 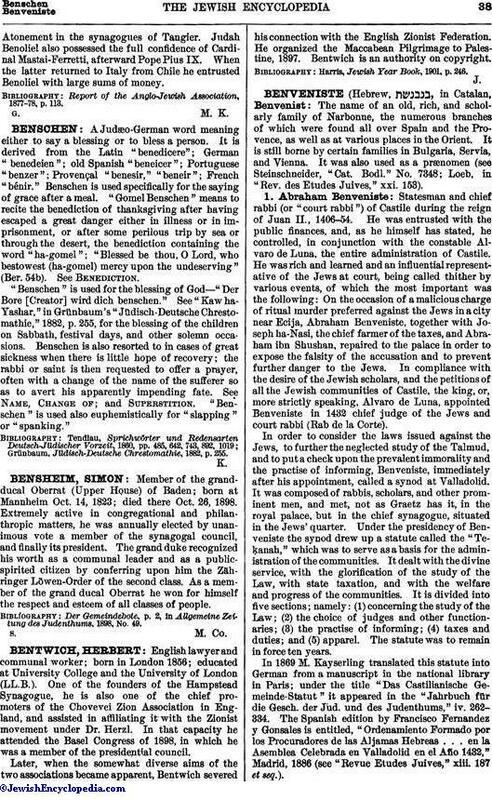 Report of the Anglo-Jewish Association, 1877-78, p. 113.